Innovative Tow/Haul mode gives the automatic transmission a dual-mode shift program. This feature raises upshift points to use more of the engine’s power for strong acceleration and raises downshift points to help slow your work van using engine braking. Contractors can opt for the adjustable shelving unit for more flexibility. An elextrician can use the shelving unit with cover cabinets for a solid surface to stack modular drawers and bins. For plumbers, the shelving unit with drawer attachment keeps your tools organized. Express Cargo Van is flexible and ready to accommodate anything. The Cargo Crew option offers available 5-passenger seating. Passenger doors and rear swing-out doors come standard for easy loading, unloading, exit or entry. 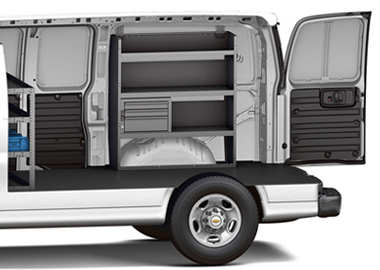 With available options for the driver and every passenger, Express is the ideal work van to accommodate every need. Forget looking for directions on your phone or fumbling around with your GPS. Simply enter the destination address and let the available navigation radio do the rest. You’ll love the easy-to-read and even easier-to-follow directions. And available OnStar makes in-dash navigation even better. Now, you can program and send destinations straight from the Internet or your smartphone to your navigation screen with eNav, or just push your blue button for help from an OnStar Advisor. 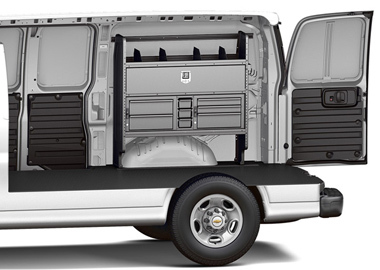 2500 Regular Wheelbase Cargo Vans have 270.4 cu. 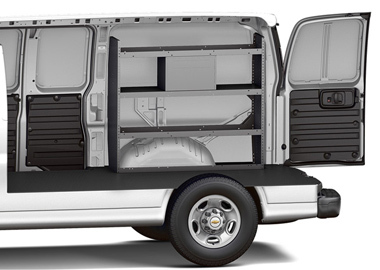 ft. of maximum cargo space and a GVWR of 8600 lbs., while 3500 Extended Wheelbase models have a massive 313.9 cu. ft. of cargo space and a GVWR of 9,600 lbs. That’s more than enough room to haul any tools you need. Advanced engineering and safety technology like the StabiliTrak® Electronic Stability Control System, standard on every Express Cargo Van, work together to help prevent collisions. Express offers optimal safety before, during and after a collision. Working in conjunction with StabiliTrak, the Trailer Sway Control feature helps you stay on track. With auto grade braking, standard on Express 2500/3500 models, the 6-speed heavy-duty transmission downshifts automatically to help slow the vehicle when you apply the brakes while descending long, steep grades.